CW CPA is a professional advisory firm founded and managed by Thomas Wong and Rosanna Choi. CW CPA offers a wide array of client-focused, tailored services of professional quality, including audit and other assurance, tax, corporate secretarial and business process outsourcing, and advisory specialisms. CW CPA’s global reach spans across different continents with offices strategically located in Hong Kong, Shenzhen, Guangzhou and Shanghai in mainland China, Barcelona in Spain, London in the UK and Bogotá in Colombia. We have teams of multinational, culturally adept and experienced multilingual professionals who are dedicated to serving clients. With our well-established and international presence, we—as well-connected trusted experts (Mandarin-, English-, German-, Portuguese- and Spanish-speaking)—advise and support overseas clients in their business operations and endeavours in mainland China as well as Chinese clients in their overseas operations. Our vision is to be the destination to which businesses go for growth by leveraging our preeminent expertise, resourcefulness and connectivity with business associates and contacts in Asia Pacific, Europe and beyond. We excel in what we do because we readily put ourselves in our clients’ shoes and attend meticulously to their every need. We understand that no two clients are the same, nor do we believe in a “one-size-fits-all” approach. Our philosophy to put our clients at the centre of everything we do is reflected in our commitment to providing a comprehensive and integrated solution delivered in an efficient and timely manner by acting as a “one-stop” provider of professional services. -Trust and respect in dealing with our clients, employees and other stakeholders. Integrity, both professional and personal, governs how we interact with others. People and relationships, around which business ultimately revolves, are at the heart of our culture. We go the extra mile to give a little something back to our staff, the community and the world at large. In addition to helping businesses grow, we are equally committed to fostering inclusive growth in our society of which we are all members. We believe that our collective energy and expertise can be harnessed to make a lasting positive impact in the wider community. The Hong Kong Council of Social Service (HKCSS) awarded the Caring Company Logo to CW CPA in 2019, in recognition of our commitment in Caring for the Community, Caring for the Employees and Caring for the Environment over the past year(s). 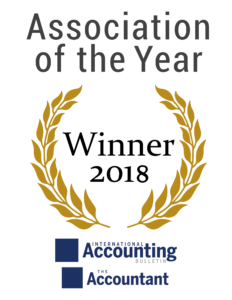 Allinial Global, a worldwide accounting association with over 130 member firms in over 380 overseas locations, was named 2018 Association of the Year by The Accountant and International Accounting Bulletin (IAB). Allinial Global issued a press release welcoming CW CPA as a new member in February 2018.